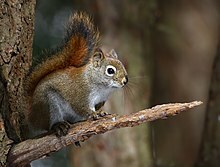 For the Eurasian species, see red squirrel. American red squirrels should not be confused with Eurasian red squirrels (Sciurus vulgaris); since the ranges of these species do not overlap, they are both commonly referred to as "red squirrels" in the areas where they are native. The specific epithet hudsonicus refers to Hudson Bay, Canada, where the species was first catalogued by Erxleben in 1771. A recent phylogeny suggests the squirrels as a family can be divided into five major lineages. Red squirrels (Tamiasciurus) fall within the clade that includes flying squirrels and other tree squirrels (e.g., Sciurus). There are 25 recognized subspecies of red squirrels. Red squirrels can be easily distinguished from other North American tree squirrels by their smaller size, 28–35 cm (11–14 in) total length (including tail), territorial behavior, and reddish fur with a white venter (underbelly). Red squirrels are somewhat larger than chipmunks. 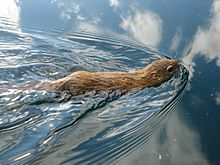 The Douglas squirrel is morphologically similar to the American red squirrels, but has a rust-colored venter and is restricted to the southwestern coast of British Columbia and in the Pacific Northwest of the United States. These species' ranges do not overlap. 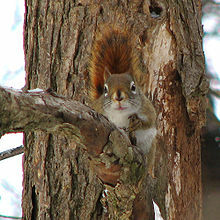 American red squirrels are widely distributed across the North American continent. Their range includes: most of Canada, excluding northern areas with no tree cover, the islands of Atlantic Canada (Prince Edward Island, Cape Breton and Newfoundland), the southern half of Alberta and the southwestern coast of British Columbia; the southern half of Alaska; the Rocky Mountains area of the United States, and northern half of the eastern United States. American red squirrels are abundant and not of conservation concern throughout much of their range. However, an isolated population of red squirrels in Arizona has experienced considerable declines in population size. In 1987, this portion of the population was listed as an endangered species. American red squirrels are primarily granivores, but incorporate other food items into their diets opportunistically. In Yukon, extensive behavioral observations suggest white spruce seeds (Picea glauca) comprise over 50% of a red squirrel's diet, but squirrels have also been observed eating spruce buds and needles, mushrooms, willow (Salix sp.) leaves, poplar (Populus sp.) buds and catkins, bearberry (Arctostaphylos sp.) flowers and berries, and animal material such as bird eggs or even snowshoe hare leverets (young). White spruce cones mature in late July and are harvested by red squirrels in August and September. These harvested cones are stored in a central cache and provide energy and nutrients for survival over the winter and reproduction the following spring. The fallen scales from consumed seed cones can collect in piles, called middens, more than a meter across. White spruce exhibits two- to six-year masting cycles, where a year of superabundant cone production (mast year) is followed by several years in which few cones are produced. American red squirrel territories may contain one or several middens. American red squirrels eat a variety of mushroom species, including some that are deadly to humans. American red squirrels are spontaneous ovulators. Females enter estrus for only one day, but venture from their territory prior to ovulation, and these exploratory forays may serve to advertise their upcoming estrus. On the day of estrus, females are chased by several males in an extended mating chase. Males compete with one another for the opportunity to mate with the estrous female. Estrous females will mate with 4 to 16 males. Gestation has been reported to range from 31 to 35 days. Females can breed for the first time at one year of age, but some females delay breeding until two years of age or older. Most females produce one litter per year, but in some years reproduction is skipped, while in other years some females breed twice. Litter sizes typically range from one to five, but most litters contain three or four offspring. Offspring are pink and hairless at birth and weigh about 10 g. Offspring grow at approximately 1.8 g per day while nursing, and reach adult body size at 125 days. They first emerge from their natal nests at around 42 days, but continue to nurse until approximately 70 days. Nests are most commonly constructed of grass in the branches of trees. Nests are also excavated from witches' broom – abnormally dense vegetative growth resulting from a rust disease – or cavities in the trunks of spruce, poplar, and walnut trees. American red squirrels rarely nest below ground. Each individual squirrel has several nests within its territory, and females with young move them between nests. Some behavior has been reported within human dwellings using insulation as nesting fodder. A three-year study of a population of red squirrels in southwest Yukon reported female red squirrels showed high levels of multiple-male mating and would even mate with males with similar genetic relatedness. The relatedness of parents had no effect on the neonatal mass and growth rate of their offspring, nor did it affect the survival rate of offspring to one year of age. Juvenile American red squirrels must acquire a territory and midden prior to their first winter to survive. They can acquire a territory by competing for a vacant territory, creating a new territory or by receiving all or part of a territory from their mothers. This somewhat rare (15% of litters) female behavior is referred to as breeding dispersal or bequeathal, and is a form of maternal investment in offspring. The prevalence of this behavior is related to the abundance of food resources and the age of the mother. In some cases, females will acquire additional middens prior to reproduction, which they later bequeath to their offspring. Offspring that do not receive a midden from their mother typically settle within 150 m (3 territory diameters) of their natal territory. Observations suggest that male red squirrels have environmentally induced, alternative reproductive strategies that result in higher incidences of sexually selected infanticide in years when food is plentiful. American red squirrels experience severe early mortality (on average only 22% survive to one year of age). The survival probability, however, increases to age three, when it begins to decrease again. Females that survive to one year of age have a life expectancy of 2.3 years and a maximum lifespan of eight years. 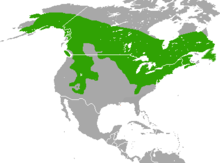 Chief predators include the Canadian lynx (Lynx canadensis), bobcat (Lynx rufus), coyote (Canis latrans), great horned owl (Bubo virginianus), northern goshawk (Accipiter gentilis), red-tailed hawk (Buteo jamaicensis), American crow (Corvus brachyrynchos), American marten (Martes americana), red fox (Vulpes vulpes), gray fox (Urocyon cinereoargenteus), wolf (Canis lupus), and weasel (Mustela sp.). ^ Thorington, R.W. Jr.; Hoffmann, R.S. (2005). "Family Sciuridae". In Wilson, D.E. ; Reeder, D.M. Mammal Species of the World: a taxonomic and geographic reference (3rd ed.). The Johns Hopkins University Press. pp. 754–818. ISBN 978-0-8018-8221-0. OCLC 26158608. ^ Goheen, Jacob R.; Swihart, Robert K.; Robins, James H. (2003). "The anatomy of a range expansion: Changes in cranial morphology and rates of energy extraction for North American red squirrels from different latitudes". Oikos. 102: 33–44. doi:10.1034/j.1600-0706.2003.12407.x. ^ Woods, S.E.J. (1980). The Squirrels of Canada. National Museums of Canada. ^ Mercer, J. M.; Roth, V. L. (2003). "The Effects of Cenozoic Global Change on Squirrel Phylogeny" (PDF). Science. 299 (5612): 1568–72. doi:10.1126/science.1079705. PMID 12595609. ^ a b c d Steele, M.A. (1998). "Tamiasciurus hudsonicus" (PDF). Mammalian Species. 586 (586): 1–9. doi:10.2307/3504443. JSTOR 3504443. ^ Osgood, W.H. (1900). "Results of a biological reconnaissance of the Yukon River region. General account of the region. Annotated list of mammals. Annotated list of birds". North American Fauna. 19: 1–100. doi:10.3996/nafa.19.0001. ^ Arizona Game and Fish Department. (2003). Tamiasciurus hudsonicus grahamensis. Heritage Data Management System, Arizona Game and Fish Department, Phoenix, AZ. ^ Willson, Mary F.; De Santo, Toni L.; Sieving, Kathryn E. (July 2003). "Red squirrels and predation risk to bird nests in northern forests". Canadian Journal of Zoology. 81 (7): 1202–1208. doi:10.1139/z03-096. ^ Kelly, D (1994). "The evolutionary ecology of mast seeding" (PDF). Trends in Ecology & Evolution. 9 (12): 465–70. doi:10.1016/0169-5347(94)90310-7. PMID 21236924. ^ Nienstaedt, Hans; Zasada, John C. (1990). "Picea glauca". In Burns, Russell M.; Honkala, Barbara H. Conifers. Silvics of North America. Washington, D.C.: United States Forest Service (USFS), United States Department of Agriculture (USDA). 1 – via Southern Research Station (www.srs.fs.fed.us). ^ Wernert, Susan J. (1982). Reader's Digest North American wildlife (2. pr. ed.). Pleasantville, NY [u.a. ]: Reader's Digest Assoc. ISBN 978-0-89577-102-5. ^ Layne, James N. (1954). "The biology of the red squirrel Tamiasciurus hudsonicus loquax in central New York". Ecological Monographs. 24 (3): 227–268. doi:10.2307/1948465. JSTOR 1948465. ^ Millar, John S. (1970). "The breeding season and reproductive cycle of the western red squirrel". Canadian Journal of Zoology. 48 (3): 471–473. doi:10.1139/z70-079. ^ Lair, H. (1985). "Length of gestation in the red squirrel, Tamiasciurus hudsonicus". Journal of Mammalogy. 66 (4): 809–810. doi:10.2307/1380818. JSTOR 1380818. ^ When It Comes to Female Red Squirrels, It Seems Any Male Will Do. Newswise (20 June 2008). ^ a b Berteaux, Dominique; Boutin, Stan (2000). "Breeding Dispersal in Female North American Red Squirrels" (PDF). Ecology. 81 (5): 1311. doi:10.1890/0012-9658(2000)081[1311:BDIFNA]2.0.CO;2. JSTOR 177210. ^ Boutin, S; Larsen, K. W.; Berteaux, D (2000). "Anticipatory parental care: Acquiring resources for offspring prior to conception". Proceedings of the Royal Society B: Biological Sciences. 267 (1457): 2081–2085. doi:10.1098/rspb.2000.1252. PMC 1690781. PMID 11416912. ^ Haines, Jessica A.; Coltman, David W.; Dantzer, Ben; Gorrell, Jamieson C.; Humphries, Murray M.; Lane, Jeffrey E.; McAdam, Andrew; Boutin, Stan (2018). "Sexually selected infanticide by male red squirrels in advance of a mast year". doi:10.25316/ir-1436. ISSN 0012-9658. Wikimedia Commons has media related to Tamiasciurus hudsonicus.